On Opening Day each session we get hundreds of campers checked in, checked for lice and temperature, settled in bunks and introduced to their counselors and bunkmates in just a few hours time. We have everyone through the check-in process by lunch. It sounds like a lot to do in just a few hours, but being done by lunch gives us all afternoon to get settled and start the fun of getting to know camp and each other. 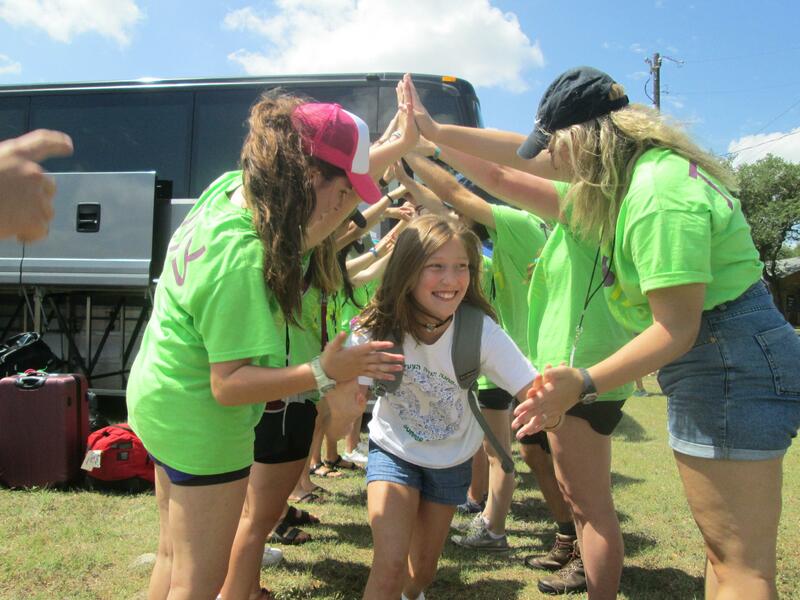 Our favorite way for kids to begin the camp experience is on the bus —getting to know other campers, staff, cheers, and songs. Not only does taking the bus help campers transition into camp-mode, it also helps parents transition. For those campers coming to camp by car, we open the gates to car arrivals at 11:00 am. Once the parents have navigated the check-in process and seen their campers to their cabins, we ask that they let the staff take over and help with unpacking and bed-making. By 12:30, all parents should be on their way and the campers should be getting to know their new friends and counselors. If you are joining us from outside of Texas and are flying in, we've got you covered. Read the article below for more information about flying to camp, when to arrive, how to get to camp, and more. Want to get the whole travel picture? Read up on Closing Day too.